The moment we’re born, clothing gets slapped on us. And for most of us, that founding moment foretells a nearly lifelong, complex relationship (even obsession) with what we wear. It’s understandable: No other objects touch our bodies every single day, and our clothes are a powerful nonverbal projection of “who we are.” So, our relationship with fashion gets imbued with tons of emotion (from joy to misery): Clothes can make me new, better, sexier and more sophisticated or make me look ugly or off trend. This magical thinking drives us to overbuy, stuffing our closets with purchases we thought would transform us but typically gather dust and regrets or get tossed. This problem of fashion overconsumption has, of course, been radically worsened by the rise of “fast fashion” over the last couple of decades: the manic overproduction of ever-cheaper clothes and ever-changing trends that encourages people to buy, buy, buy—and has made clothing a profoundly disposable concept. Fast fashion, driven by globalization (cheap labor and resource markets, which means clothing gets designed in one country, made in another, and sold in yet another), has led to production doubling in the last 15 years. Eighty billion pieces of clothes are now produced worldwide each year! It’s impossible to overstate the disastrous impact this greedy, throwaway fashion machine has on the environment and humans: the waste…the pollution…the garment workers (mostly women) paid 40–60 cents/hour in places such as Bangladesh or Vietnam. Every second, the equivalent of one garbage truck of textiles is landfilled or burned. Three in five garments bought end up in a landfill/burned within a year. Less than 1 percent of clothing material is ever recycled. This “take-make-dispose” model creates a staggering 1.2 billion tons of greenhouse gas emissions annually and dumps 20 percent of all global wastewater, and if nothing changes, the fashion industry will use up more than 25 percent of the world’s entire carbon budget by 2050. Given these realities, it’s odd how little attention the world has paid to the complex intersection between “wellness” and “fashion,” beyond the familiar story of athleisure disrupting the market. Or how few people that are wellness- and eco-minded—who drive around in a Prius, eat all-organic, and have a mini-stroke if someone serves their fresh-pressed juice with a plastic straw—have really grappled with their relationship to and consumption of clothes, learned about their source and true environmental impact, or pondered the many negative ways that fashion impacts their wellbeing—or imagined the positive ways that it could. Because the world desperately needs a more “well fashion” and because there are so many powerful new directions in fashion that are healthier-for-the-planet-and-people, it was a hot topic at the 2018 Global Wellness Summit. It spanned iconic Italian fashion designer Alberta Ferretti keynoting on what wellness in fashion meant to her and the first “wellness fashion show”: a creative collaboration between BuDhaGirl, a fashion brand focusing on mindful glamour; Louie Schwartzberg’s extraordinary biophilic cinematic art; and La Forma, an athleisure maker with sustainable values at its core. BuDhaGirl Founder and CEO, Jessica Jesse addresses delegates at the 2018 Global Wellness Summit on “The Concept of Wellness in Fashion.” Jesse’s presentation provided the inspiration for the Well Fashion Trend. But it was BuDhaGirl founder and CEO Jessica Jesse’s talk, “The Concept of Wellness in Fashion,” that provides the inspiration and framework for this trend: how the market and mindset around fashion will move from unhealthy to more “well”—better for the planet, for the people that make clothes, and for us, the people that wear them. The trend parallels in many ways how the beauty industry is currently being remade by wellness concepts. People are finally hearing and feeling this unfolding nightmare, and more research shows the horrible role that the $2.4 trillion fashion industry plays in our Earth’s destruction. The stats could fill a book. The fashion industry spews 1.2 billion tons of greenhouse gas emissions a year, more than all international flights and maritime shipping combined. Washing our clothes releases half a million tons of microfibers into the ocean every year, equal to 50 billion+ plastic bottles. Textile dyeing is the second-largest water polluter in the world, and it takes 2,000 gallons of water just to make a typical pair of jeans! Westerners like to blame developing economies, such as China and India, for their new hyper-consumption ramping up the climate crisis. But research shows people in emerging Eastern countries are more sustainability-focused than Americans and Europeans: They purchase a fraction of the clothes and are more likely to buy local fashion. For instance, only a third of shoppers in developed countries seek sustainable fashion, compared with 78 percent of Indians and 65 percent of Chinese. The mall-rat American reality: Clothing consumption has doubled to 14 million tons a year in under two decades, and 35 billion pounds of clothes will get thrown away in 2019. The average American buys a jaw-dropping 86 items of clothing a year, 80 percent of which they seldom wear, with each of us sending 70 pounds annually straight to dumpsters. UK shoppers send 300,000 tons of clothes to landfills every year and keep $46.7 billion worth of unworn clothes in their closets. More designers are creating apparel from sustainable materials. Vivobarefoot’s Ultra III Bloom running shoes are made from algae, sourced from destructive algae blooms in waterways. Each Vivo pair prevents 40 balloons of CO2 from being released into the atmosphere. Future forecasting firm LS:N Global, whose researchers Jessica Smith and Rhiannon McGregor keynoted at the GWS, has neatly summarized the major trend that is rewriting consumer behavior: We’re “moving from an age of conspicuous consumption to an age of conspicuous conshumanism,” where people display their humane, rather than monetary, worth through choices they make as consumers. With a new anxiety around wealth, spending is migrating to goods that tell a story about how they help people or the environment. You might say, after years of talk, something real is happening—and a mountain of surveys and stats confirm that the shift to sustainable, ethical brands and a new interest in “well fashion” is underway. A 2018 JWT Intelligence survey found that 90+ percent of global consumers are trying to live more sustainably and think that brands that pollute the environment should be fined. A recent Ipsos MORI/Fashion Revolution poll of Europeans found that consumers now demand to know more about the environmental/social impact of the clothes, shoes and accessories they buy, with 75+ percent reporting that fashion brands should be required by law to be ethical and sustainable. The clearest window into trends is social media, where billions of people post and search, and global fashion search platform Lyst reported a 47 percent growth in sustainability-focused fashion keywords in 2018 (such as “vegan leather” or “organic cotton”). “Sustainable fashion” made Pinterest’s top social trends for 2019. And a vocal tribe of celebrities and social media influencers are making a bigger “well fashion” impact than public service announcements ever could. Perhaps no one more than Meghan Markle, who loudly and proudly wears sustainable/ethical fashion brands. When she donned a pair of Outland Denim jeans, their web traffic skyrocketed 3,000 percent—and her choice meant that the company could employ 30 more seamstresses rescued from human trafficking/sexual exploitation in its Cambodian production house. It would be naïve to expect people to suddenly stop shopping or for eco-activist fashion brands (which can remain more niche) to make the massive dent needed. But with the unthinkable economic and human cost of climate change looming, and fashion’s terrible role in it better understood, more large public organizations and governments are taking action to move the fashion industry from its linear, take-make-waste model to a sustainable circular economy. A big move: On December 10, a Fashion Industry Charter for Climate Action was launched by the UN, and 40 big brands and suppliers—such as Stella McCartney, Burberry, Adidas and H&M—pledged to collectively take action on the environmental/social impact of the fashion industry and cooperate with the charter’s 16 targets, including net zero emissions by 2050, the use of sustainable materials, and low-carbon transport. Brand participation is voluntary, but the UN Charter ratchets up the pressure globally. France is a standout nation for legal action, where fashion makers must take responsibility for the end of the life of the clothing they make (through collecting and recycling programs), and the country is considering legislation to limit the volume of various fibers that makers can place on their market. Let’s just say that the US is doing nothing of the kind, and more regulatory action is needed worldwide and—we predict—is ahead. There are hundreds (and hundreds) of sustainable, ethical and wellness-focused fashion brands across the world: hundreds of indie brands along with globally recognized pioneers, such as Stella McCartney, Eileen Fisher and Patagonia, all reaching for evermore sustainable and ethical practices. (Just visit Patagonia’s website and digest all they’re doing as a company and environmental activist, all while humbly admitting that they are still, as an apparel maker, “part of the problem.”) Fast fashion companies such as H&M are making important moves, with their new goal of selling strictly sustainable products by 2030. The sheer volume of clothes that the fast fashion kings sell (hundreds of millions of items each year) means any positive changes they make have a vast impact. This trend follows the logic of tracking the garment across its lifecycle (a kind of “tale of the traveling pants”) to identify some key innovations in how clothing will get designed, made, bought, worn, experienced, washed and reused in the future. ZOZOSUIT from Japan sends customers a free ZOZOSUIT interwoven with 300 sensors that capture, in 3D, exact measurements; customers order tailored-to-their body clothes. A new era of AI and 3D design technologies means brands could break the spray-and-pray model of overproducing cookie-cutter clothes and start delivering much smarter, on-demand, made-to-order clothes. As Sue Siegel, chief innovation officer at GE put it, “(With the combination) of AI, materials, design, and 3-D technology…you get a massively bespoke approach to designing jewelry, clothing and shoes. You’ll soon see it come much more into our lives and pervade everything we do.” This digital-only and machine-learning-powered fashion design is far more sustainable: It reduces production volume because items are only produced when necessary, and, because they are custom-designed to actually fit (with preferred colors and features), they will actually get worn. Bespoke clothes may once have been the exclusive province of Wall Street banker types, but, in the future, the designed-for-me concept will get more democratic. Change of Paradigm is developing virtual and holographic reality apps that let people experience clothing before they buy: They use digital textiles to ensure fit, and, at the click of your mouse, you can change patterns, prints and features. Sustainable fashion brands, such as Atacac, are now using the software. CLO has developed 3D virtual prototyping programs so fashion designers can create without ever sewing or cutting a physical pattern: Everything’s done online. Companies, such as Denmark’s Solve, are rolling out downloadable fashion: If you have access to a laser cutter (found in more places now), you can download their handbag patterns, laser-cut the recycled fabrics, and, for a few bucks and 20-minute assembly time, you have a cool, sustainable new bag. ZOZO, the brainchild of Japan’s leading e-commerce site, is a concept that makes your clothes fit precisely. They send you a free ZOZOSUIT interwoven with 300 sensors that capture in 3D your exact measurements, and, with their smartphone app (which lets you model your selections in 3D before ordering), you then order bespoke, tailored-to-your-body clothes. Think basics like sweaters, shirts, tees and jeans in natural fibers, at democratic, under-$100 prices. (ZOZO is now available in 72 countries/territories.) Our future is more on-demand, digitally designed and custom-created-for-you fashion. So many materials we’ve been making clothes out of are Earth killers. Man-made fabrics, such as nylon, polyester and acrylic, are petroleum-based, meaning they can take centuries to decompose—and they release tsunamis of plastic microfibers into oceans and lakes. Toxic bleach, dyes and thousands of other chemicals used in clothing manufacturing pollute our air and water. Clothes packed with chemicals and dyes can hurt our bodies: A rash is one thing, but chemicals, such as dimethylformamide, found in some workout clothes have been linked to liver damage, while wrinkle-free clothes can get coated with formaldehyde, a carcinogen. The future is natural fibers that are sustainably sourced, such as silk, linen, organic cotton, wool, flax, hemp and alpaca, and semisynthetic and cellulosic fibers, such as modal, rayon, Tencel, lyocell and cupro, that involve “man-making” but break down easier. But there’s so much radical innovation in sustainable materials happening. A small army of companies is crafting clothing from zero-waste, hyper-renewable algae. Israeli-based Algalife turns algae into fibers and dyes, and the fabrics are also designed to improve and protect skin, as proteins, vitamins and anti-inflammatories are naturally released by algae-immersed fabric. AlgiKnit crafts yarns from algae for use in clothes and shoes. 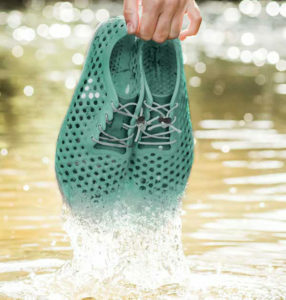 Vivobarefoot created the Ultra III Bloom running shoes made from algae, sourced from destructive algal blooms in waterways that release toxic chemicals. Each Vivo pair prevents 40 balloons of CO2 from being released into the atmosphere. There’s fungi fashion, such as MycoTEX, who, with Utrecht University, is pioneering custom-made clothes fashioned from decomposable mushroom roots. Another pack of pioneers, such as Agraloop, is making textiles out of food crop leftovers, creating biofibers from things, such as banana and pineapple, whose fabrics are slated for collaborations with heavy-hitter fashion brands. Reebok’s new Cotton +Corn trainers fashion their soles from a long-wearing corn derivative. Call it “trashion,” or waste-makes-taste, recycling all kinds of garbage into trendy new clothing, accessories and shoes is everywhere. Patagonia is a pioneer and has been making fleece jackets using polyester made out of recycled bottles for 25 years (with a collection heavily made up of recycled nylon, cotton, polyester, down, cashmere and wool). Plastic water bottles are an environmental scourge, with a million a minute sold worldwide, and recycled plastic fashion is now surging. Start-up Aday uses recycled plastic to make its futuristic clothes (one jacket is made from 41 reconstituted water bottles). Everlane is launching a line called ReNew made entirely from millions of recycled water bottles; Chilean brand Novedades creates luxury fashion from plastic bags; Rothy shoes are made from 100 percent-recycled bottles; and Spain’s Ecoalf creates clothes and shoes from algae and recycled plastic as part of its Upcycling the Oceans collection. Other trash-trawling fashion includes transforming ocean waste (whether plastics or discarded fishing nets) into regenerative materials: brands, such as Adidas, Stella McCartney, Riley Studio, and Gucci, are partnering with activists, such as Parley for the Oceans, who sources materials from companies, such as Aquafil, that turn ocean garbage into amazing materials, such as Econyl. Indosole turns discarded tires in Indonesia into a whole shoe line, and Amsterdam’s Gumdrop, who says 3.3 million pounds of gum end up on that city’s streets every year, “chews” that discarded gum into a new kind of rubber for shoes with fashion brand Explicit. Cruelty-free and vegan clothing/shoes/accessories are a hot trend led by fashion icons, such as Stella McCartney and Calvin Klein. Shown here: garments from Budapest-based Nanushka’s vegan haute clothing line. The fashion industry employs an estimated 300 million people, and, while most of us know that most of these workers get paid very little for working awful hours in unsafe environments, we don’t really grasp the extent and landscape of this modern slavery. Globalization means brands manufacture where wages are most shockingly low (Bangladesh, Vietnam, India, Cambodia and Mexico), and the industry war for rock-bottom prices means a supply chain where fashion brands often don’t even own their factories or visit them. The upshot? Many clothes in your drawers are made by some of the world’s most vulnerable and exploited people, often forced into labor and not paid at all. Nonprofit KnowTheChain offers a report and system, scoring the world’s megabrands on how they’re treating workers. In a nutshell, abominable: Out of a 100, the average score was 37! Adidas and Lululemon scored highest, and, surprisingly, fast fashion companies fared well, while many luxury brands, such as Prada or Ferragamo, performed horribly. Access this important report here. More people are demanding ethical fashion, and the future is more action by brands on (and transparency into whether they’re delivering) fair compensation, human rights and healthy workplaces. So many fashion companies are now going beyond “ok” to dramatically empower the economic lives of local makers and artisans. 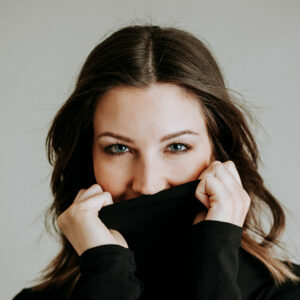 Fashion4Freedom is smashing the old exploit-the-worker factory production model by giving artisans of traditional Vietnamese crafts their own equipment and then connecting those creators to sustainable brands—so they become the entrepreneurs. Malaysia’s Earth Heir makes entrepreneurs out of Malaysian craftsmen/women, working as an intermediary that creates fair access to markets. The ethical e-commerce fashion site Nisolo, founded in response to the tragedy at the Rana Plaza factory in Bangladesh that killed 1,134 workers, eliminates the money-pocketing brand middleman by bringing the clothes and shoes made by extraordinary artisans (the craftspeople luxury brands turn to) directly to the consumer. Egypt’s Okhtein (a bag maker worn by Beyoncé) works with Egyptian NGOs to empower women artisans that face economic hardship. Transparency into Creators: If manufacturing is a faceless business, now more brands are providing transparency into the supply chain and their makers—and even celebrating by name the people who make your clothes and shoes. Everlane’s “Radical Transparency” program ensures that its factories embrace fair labor laws: It ranks them on their compliance with those laws and honestly shows shoppers how much it costs to make each and every product. Known Supply Apparel provides info on the artisan from an underserved community who stitched your garment; each piece is hand-signed, and you can even send the maker a thank-you note. 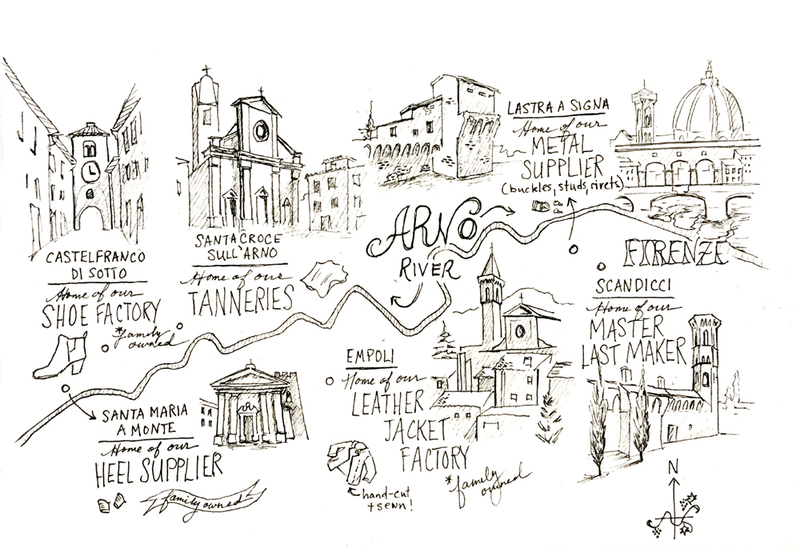 With each leather good you buy, Italy’s Arno Cooperative sends a photo of the craftsperson that fashioned it, a map of all the places in Tuscany where it is made, and Arno’s website has info on each artisan’s family and life. And you can send a thank-you note right back to the maker. Fairness in fashion, for people with actual faces, is one humane future trend. Arno Cooperative sends a photo of the craftsperson, along with a map of places in Tuscany where the item is made. Vegan is the hot trend in eating, and it is also in fashion, as more people now care about the ethical treatment of animals. If the luxury fashion world has always been heavy on fur, leather and rare skins, things are being seriously shaken up, with more brands nixing animal materials from their lines and unleashing a wave of alt-fur, alt-leather, alt-everything that is actually trendier than the real thing.New technologies are able to create fake fur and leather that looks amazing, with the latter market forecast to hit $85 billion by 2025. Stella McCartney has been the hands-down trailblazer here, with a brand centered on cruelty-free fashion, and Calvin Klein is an activist, too. So many brands have recently bid farewell to fur: Burberry, Versace, Furla, Michael Kors, Gucci, Tommy Hilfiger, Maison Margiela, Fendi, Armani, Hugo Boss and Ralph Lauren—along with online shopping sites, such as Net-A-Porter and YOOX, and entire cities, such as San Francisco. Many of the hippest, fastest-growing brands are all about wearing your vegan cred, such as Paris-based Veja, with its vegan shoes/sneakers collection worn by Meghan Markle, or Budapest-based Nanushka, with its rave-gathering vegan haute clothing line or uber-cool vegan footwear brand Yatay. Clothes are pressed against our bodies all day, but aside from keep-me-warm or cover-me-up functionality, they’ve been rather “dumb.” No longer; a revolution in smart materials is doing what makes nothing but sense: clothing that optimizes your wellbeing while you wear it. A dizzying array of new technologies—from Internet-of-Things hardware/software to body-mapping technologies—mean futuristic fashion can embed numerous wellness benefits, such as clothes that adapt to all kinds of environmental and bodily changes (heat, cold, air flow, UV rays, etc.). But the trend spans much more than environmental response clothing. An era of “active well clothing” that is connected, intelligent and healing is rising: from anti-bacterial clothes that clean themselves to clothes that can heal or moisturize your body to clothes that express your mood. Some of these high-tech concepts give new meaning to the idea of “comfortable clothes.” A collaboration between Zaha Hadid Design and Swiss tech-sports brand Odlo offers base layer leggings and tops that deploy seamless knit technology and organic body mapping to control the flow of air around the body and adapt to your breathing and movement, like a second skin. 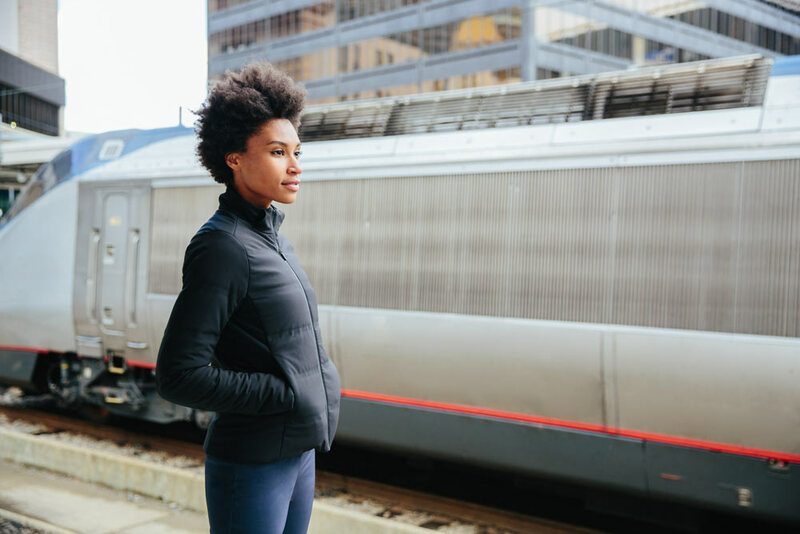 Ministry of Supply, brainchild of MIT-schooled engineers, has a mission of using tech to make clothes smarter and more comfortable, and their new, wirelessly-charged smart jacket automatically adjusts the temp based on the weather, your body temp, and how much you are moving—and is activated by a phone app or smart assistant, such as Alexa. Clothing brand Become uses techwear fabrics to help menopausal women manage hot flashes and night sweats. There are clothes that help our bodies heal and sleep better. Under Armour’s Athlete Recovery Sleepwear (created with quarterback Tom Brady) enmeshes bioceramic technology into pajamas that absorb infrared wavelengths emitted by the body to reflect them back as far infrared energy, to help the body recover faster and sleep better. Start-up Lumiton has just created a sunlight-activated Wear Healthy line powered by laser technology that is designed to deliver multiple wellness benefits: The UV-protecting fabrics are infused with laser dyes that get energized with sunlight to produce red and near-infrared light, whose wavelengths, they argue, increase collagen and muscle growth and reduce pain/inflammation. For intense sports, Aexos has created garments that use biomapping and new materials that protect during impact to reduce whiplash and concussion (Hello, football world). For instance, its Halo shirt has a high collar that remains soft and flexible normally but stiffens and protects on impact. Think how an adaption of this tech could help bone-fragile elderly people (all those broken hips), providing stiffening, protecting clothing for hard falls. If the world is mad for collagen as an ingestible beauty supplement, now wearable collagen is a thing. Tech sportswear brand Buki has released a chemical-free Collagen Collection, which embeds collagen into fabrics to provide all-day moisturizing, and the effect never wears out because the fabric is made of the protein. And new fabrics are being crafted interweaving other proteins, like milk. Beyond the futuristic, another trend is weaving “ancient wellness” healing and herbal properties into fabrics and clothing collections. Eco-chic Australian label Kitx uses Ayurvedic recipes to dye their collection and to infuse them with antibacterial properties; menswear line Emily Bode creates aromatic textiles suffused with Indian medicinal plants (such as turmeric, neem and basil). And if we had Earth Shoes in the 70s, trendy footwear designer Astara has essentially created earthing shoes, using crystals, such as black onyx and blue apatite, so that the shoes resonate at the same vibration as Earth’s magnetic field (7.83 hertz), and you feel like you’re walking barefoot on grass or sand. Another trend: high-tech clothes that allow you to express yourself—or what you might call mood clothing. University of Central Florida scientists have created a color-adaptive material (ChroMorphous) that lets wearers control the color and pattern of their clothes using an app; India-based Broadcast Wearables has created a programmable t-shirt called Sygnal that allows people to change designs and slogans with a tap on the logo. Biomeasuring wearables are fast moving into pretty jewelry, just as they’re expanding from tracking fitness/performance to measuring things, such as stress and mood. And smart, wellness-tracking tech is now moving into clothes—smart because they’re already on us anyway. Ralph Lauren’s PoloTech shirt monitors heart rate, stress and energy output; SUPA makes smart, heart-rate monitoring bras; Wearable X even makes connected yoga pants that vibrate to guide users through yoga postures and sequences. Fast Company recently reported on what looks to be a crucial breakthrough for the smart clothing space, whose adoption has been held back by the need for these clothes to have a heavy battery (how do you clean it?). Engineers at the University of Massachusetts, Amherst, have discovered a way to store and generate energy in fabrics without big power cells. It’s complex science (vapor-coated conductive threads, a flexible mesh of electrodes), but it allows fabrics to easily power things, such as temperature sensors, motion trackers and haptic feedback devices. And the creators argue that this method can be “scaled up and remain cost-effective” for mass production. This is the kind of breakthrough that would indeed usher in a much-needed next gen of smart clothing. LS:N Global’s 2019 trends report spotlighted a new direction in fashion that may have people over 50 scratching their heads but has a fascinating future: all-digital fashion designed to be exclusively strutted online and at social media sites. It speaks to younger generations where styling oneself on Instagram is as important (more?) than getting decked out in “real life”—and what could be eco-friendlier, with no material production or transport needed? As LS:N points out, “Avatars are the new fashion models, and younger consumers are already collectively spending millions on virtual outfits for their Fortnite characters.” It’s fashion for the selfie generation that needs no “shelfie.” And if the hysterical consumption of real, resource-devouring clothes has been spurred on by show-off social media culture, this is some digital, eco-conscious payback. Tech innovation means digital fashion brands can create hyper-realistic and more boundary-pushing clothes. A couple of the new players: Norway-based all-digital retailer Carlings’ Neo-Ex collection costs up to $20, and your new clothes get digitally “fit” onto your photo by their digital 3D designers. (The company’s mission is to raise awareness of the environmental cost of the throwaway culture associated with fashion influencers.) London’s 3D designer Catherine Taylor creates super-realistic virtual clothing that, when animated, has the movement and physical properties of real fabrics. We live in a make-buy-trash fashion culture: Eighty-three percent of our clothes/shoes get chucked in the garbage. And in 2018, there were reports about fashion’s nasty secret: Brands incinerate/shred unsold stock to protect their halo of exclusivity. For instance, Burberry acknowledged it destroyed $36 million worth of unsold clothes/accessories in 2017! Thankfully, there is now an incredible surge in new platforms that upcycle all those dead dresses. And a reuse and re-wear revolution is really disrupting the “buy new” fashion world, whether it’s recycling old fabric into new clothes or brands stepping up buyback programs (and rewarding you for that closet clean-out to the big uptick in luxury, used online clothing sites to vintage staging a comeback or the fact that you can now rent your wardrobe. It’s a much more virtuous circular economy, giving many potential lives to each item of clothing. So many brands are upcycling cast-off material into new creations. Eileen Fisher’s powerful recycling program called Renew has taken back over a million garments to repurpose, and the old-made-new garments are sold in its stores or pop-up shops where that $300 jacket gets reincarnated at less than $100. Reformation is a cult brand that remakes old materials and vintage clothing into feminine creations. Dead stock becomes live stock with brands such as Cambodia’s tonlé, which uses surplus fabric from mass clothing makers and turns it into zero-waste collections, or Queen of Raw, which connects designers and textile firms with dead stock fabrics from factories/brands. Subscription-based brands let people return worn clothes for new ones: For Days lets you send back worn t-shirts for new ones, with the collected tops getting recycled into new tees. Because high-end hotels need to constantly give guests fresh sheets (and the endless laundering means they wear out fast), in 2018, wellness hotel brand Westin began a new program recycling the tens of thousands of pounds of sheets/towels from its global hotels into pajamas for children in homeless shelters—even developing a proprietary way to break down the old fibers to make new fabric. So many brands will now reward you for bringing back your unwanted clothes for recycling. Guess just partnered with I:Collect (which gathers/recycles used fashion), so if you bring in five clothing items you get 15 percent off—and H&M has a similar deal. J.Crew partnered with Blue Jeans Go Green, which recycles old denim to build housing for communities in need: Bring back a gently used pair to J.Crew and get a $20 discount on new ones. Sweden-based Nudie Jeans gives a discount if you return your old jeans, and they provide free repairs for life. UK department store John Lewis’s buyback plan: Gather at least £50 worth of clothing, a courier fetches your items, and you get sent a gift card matching their value. Online, sustainable used clothing emporium thredUP has just launched the thredUP x Reformation UPcycle kit: They send you the kit, you fill it with unwanted clothing from any brand, and send it back. For clothing that passes their resale test, you get money or a Reformation credit (and they’ll responsibly recycle those clothes that don’t make the cut). An ever-growing number of online resale shops (where you can both sell and buy) has led to an avid new generation of people hunting down luxury fashion at dramatically cheaper prices, and a perception shake-up around the concepts of value and luxury. The resold clothes/accessories market is forecast to more than double by 2022 (from $20 billion to $41 billion), and pre-owned fashion will make up around one-third of the average woman’s closet by 2027. This no longer just the province of deal-seekers and millennials: Thirteen percent of this sector is driven by millionaires. There are so many great sites where you can buy high-end for less: eBay, of course, and RealReal, Poshmark, Vestiaire Collective, Vinted and thredUP. These platforms are innovating: for instance, thredUP has a new collection concept, Remade, where they take mountains of data to identify exactly what resells to create an affordable collection designed to be resold. Each item comes with a buyback promise, ensuring it will be resold on thredUP, with sellers earning 40 percent of the original value. UK-based The Resolution Store is an online, ever-refreshed site where the piles of amazing (wasted) clothes that get gifted to fashion influencers get resold. Even traditional thrift stores, such as Goodwill, are upping their game, as they recently opened “Curated by Goodwill NYNJ, with a new aesthetic and color-coded racks of clothes. Thrifting for vintage finds, once the province of bohemians and punk rockers, is, according to Women’s Wear Daily, undergoing a major renaissance, with rare and glamorous vintage clothes now being vocally worn by celebs, sold in the toniest shops, and paraded across social media. If the Instagrams prod us to be fashion clones, vintage fashion is emerging as a deeply eco-friendly way to be truly unique. The Japanese, the largest second-hand clothing market on earth, are so mad for premium vintage that they’re depleting the world’s stock. One example of a brand bringing new-look vintage to the people: Peekaboo Vintage, whose owner Emily Bothwell lends her private collection of vintage rarities to celebs and offers a big vintage collection at Topshop and ASOS Marketplace, all while broadcasting her eco-mission: #Ilovepreloved. Platforms that let you rent your wardrobe are rising, which deliver the endorphin rush and variety of fast fashion (you get to dress like celebs dress, rotating in new designer clothes every week), without having all those environment-killing fashion mistakes rotting in your closet. Let’s face it. The fashion industry has sold us a bill of goods when they argue that clothes are “investments.” While some are longer-wearing choices than others, they simply aren’t: fashions and our body shape change all the time, we outgrow our shoes as we age, clothes fall apart, we gain a few pounds, and, after years, we sometimes just don’t want to wear that blouse, even if we can’t quite say why. The goliath in the rent-your-wardrobe space is Rent the Runway, which began as a site where you could rent that special-occasion gown but has expanded to a monthly unlimited membership service (9 million people pay the $159/mo.) giving constant access to their vast “closet in the cloud”: all the designer clothes/accessories you need for work, fancy events, pregnancies, etc. The process: Members can keep four items at a time (out of their 800,000 units from 500 designers) and rotate them in and out as fast as they want. Every item is delivered in two sizes (smart) and is returned with a prepaid shipping label to the company’s vast warehouse, dry-cleaned, and shipped out to the next wearer. And the company has partnered with WeWork, installing drop-off boxes at the co-working spaces and allowing WeWork members to rent their wardrobe via tablet, with plans to have clothing rental pop-ups in select WeWork locations. Rent the Runway reports their passionate members use the service 120 times a year (that means new items every three days! ), which the New Yorker has noted is “an extraordinary number of wardrobe refreshes for anyone other than an heiress or a royal,” while also analyzing how the digital rental concept is a democratizing shift in fashion. Why wear that grubby, in-heavy-rotation, little black dress when you can wear something different, such as a soft yellow, silk Escada shift, every week? Other rent-your-clothes pioneers: Girl Meets Dress and China’s YCloset, along with Dutch brand, Mud Jeans, which leases organic denim that can be either kept, swapped or returned. The Black Tux, focused on renting formalwear to American men, is considering a monthly subscription model, as it finds men are renting for more than special occasions, such as job interviews, dates, etc. Yes, the idea of renting versus owning what you wear requires a whole new mindset. However, it’s all part of the new experience economy, and you get to experience (and afford) far more clothes than you could ever buy. And the rent-not-own fashion model liberates us from the time and energy eaten up by shopping while freeing up space in our closets. The way we wash our clothes is arguably the most environmentally destructive stage in the whole fashion cycle. Because of our supercharged washing machines, our clothes shed half a million tons of microfibers into waterways every year, equal to 50 million plastic bottles. These microfibers end up in the food chain (so, we may be eating our athleisure!) and are associated with various health risks. We need more basics: from appliance-makers pioneering minimal water use during washing to our need to embrace organic detergents. Clothes cleaning start-ups are getting creative. Slovenia-based Planet Care has created a cartridge filter to capture the destructive fibers shed during washing and drying, for use by appliance makers or direct-to-consumer. In the future, more clothes will actually clean themselves (so they last longer and longer between cleanings). Australia’s RMIT University has created textiles that are infused with nanostructures that can degrade organic matter (dirt and grime) when exposed to any kind of light. Denmark’s Organic Basics has created organic cotton fabrics (think: underwear) woven with ultrafine silver threads (called SilverTech) that have antibacterial and antimicrobial properties (as well as being odor-controlling). Done Good: It filters fashion brands to help you identify which ones align with your values. It also offers a Chrome extension, so if you’re shopping online and Google something like “linen dress,” a sidebar pops up with suggestions for ethical brands that offer that item (plus discounts). Project Just: Breaks down brands’ ethical and sustainability practices, and, on the “Project Just Wiki,” you can find individual brand reports and summaries that nutshell that label’s pros and cons. Most of us have piles of clothes, shoes and accessories, but they get lost in our closets and drawers. Our wardrobe is not optimized. To remedy this, start-ups are using machine learning/AI and data crunching to help people build smart virtual closets—basically giving you your own digital stylist or “wardrobe wellness” coach. The free (in beta testing) app Save Your Wardrobe builds your wardrobe in two ways. For items you own, you photograph your clothes, and its computer vision technology smartly categorizes each item, even identifying the brand. Users can also let the app automatically read their digital receipts to collect every detail on new purchases (such as size, color, when you bought). With all this info, the app can then give you a complete window into all your clothes (total value, items), driving a recommendation engine that can plan what you’ll wear for the workweek or vacation ahead. And the platform will also help you manage your clothing care, repairs, donations and reselling. The brand’s language is heavily focused on wellness, with a “wellbeing tracker,” a special tool “that helps you feel better about your wardrobe.” Finery is another high-tech wardrobe app that provides smart outfit suggestions and uses a vast database of online outfits and other people’s shopping habits to power suggestions for you. The fashion industry is all about labels, not just Chanel or Levi’s, but labels such as “petite” or “plus-sized” or “man” or “woman”—dictating what you should buy, in what part of the store, and at what racks. But in our era of feminism, body positivity and “wokeness” of all kinds (especially from millennial and gen Y generations), all those labels are being questioned, and the fashion world is embracing a dramatically healthier inclusivity around body shape and gender identity that is shaking up the language they use, the runway, new collections and social media. If there is one uber-trend in fashion these last years, it’s that a new comfort is demanded: from the loose, structural and modest high fashion for women to the athleisure, workleisure and streetwear takeover. Fit has rightly become a feminist issue, given an industry that stubbornly refused to acknowledge the size of actual women’s bodies. Brands have retailed the old 0–12 when 40 percent of women globally are overweight, and, for example, the average American woman wears between sizes 16–18. In the last couple of years, companies, such as fast-growing pioneer Universal Standards, or Premme or Isolated Heroes, have stepped in to provide great-looking, sophisticated clothes for women with larger bodies. Mainstream brands, such as Reformation, J.Crew and Madewell, are expanding their size ranges up. They’re digesting the data: The size-inclusive market is expected to jump from $21 billion globally to $60 billion by 2020. But the future is total inclusivity and breaking down the walls and labels around size. Ahead-of-the-curves Universal Standards points to the new directions: It gathered a cult following for its plus-sized line, but in 2018 added smaller sizes, and in 2019 will launch collections that span 0–40. Co-founder Alexandra Waldman has argued, ”The world doesn’t need another plus-sized brand. We need to…just start making clothes for women, for everyone.” The body-inclusive fashion moves are everywhere, from Asos’s fitness line that spans petite to size 30 to Rihanna’s new, headline-grabbing, body-diverse Savage x Fenty lingerie collection to Serena William’s new line that is expanding its sizes up but just calling them the “Great” collection. A raft of studies shows that millennials and gen Z have brave new ideas about gender identity: believing it shouldn’t define people, with younger generations embracing much more fluid identities. And the future of fashion is to interrogate the constricting, arbitrary boxes we get shoved into: blue versus pink, dresses versus suits, pretty versus masculine. The first chapter in that revision is a slew of clothing brands now blurring gender lines, with a rise in unisex or “fluidly sexed” collections. If our first sartorial moment was having a pink or blue onesie clapped on us, now, more baby/kids brands are nixing gender stereotypes. For example, Celine Dion’s new childrenswear brand Celinununu has a mission to free children from the “girl” “boy” prison, with gender-free colors and dresses available for both boys and girls. More adult brands have an explicit mission of producing genderless clothes, such as Rebrand, Agender or NYC store, The Phluid Project. More mainstream brands like Asos and Zara have rolled out unisex collections. If gender-neutral clothes are welcome liberation, in pursuit of that gender-busting “middle” ideal, they can sometimes bleach the richness of what the categories of “feminine” and “masculine” once held. The future, a next stage in “well” fashion, will be more exploration of all the things that clothes could let someone be. Jessica Jesse, who provided the roadmap for this trend about the myriad ways that fashion will become more “well,” notes that while we humans are hardwired to be individuals, so much of recent (and fast) fashion has robbed us of our uniqueness and histories. In other words, the very joy of fashion: its unique power to express meaning and tell a story. The dopamine rush of swiping a credit card for another pair of identical jeans or workout leggings is not joy. If, in the West, women have but one day (their wedding) devoted to the concept of meaning and story as the very point of dressing—“something old, something new, something borrowed, something blue”—in the future, Jesse predicts, that kind of philosophy will become more everyday-important. A slower, more mindful, more self-expressive form of dressing will rise, where each item bought or chosen has value—whether because it was crafted, not mass-manufactured; or refashioned from something in your mother’s or friend’s closet; or your own more thoughtful experimentation in capturing through your clothes what makes you, you. 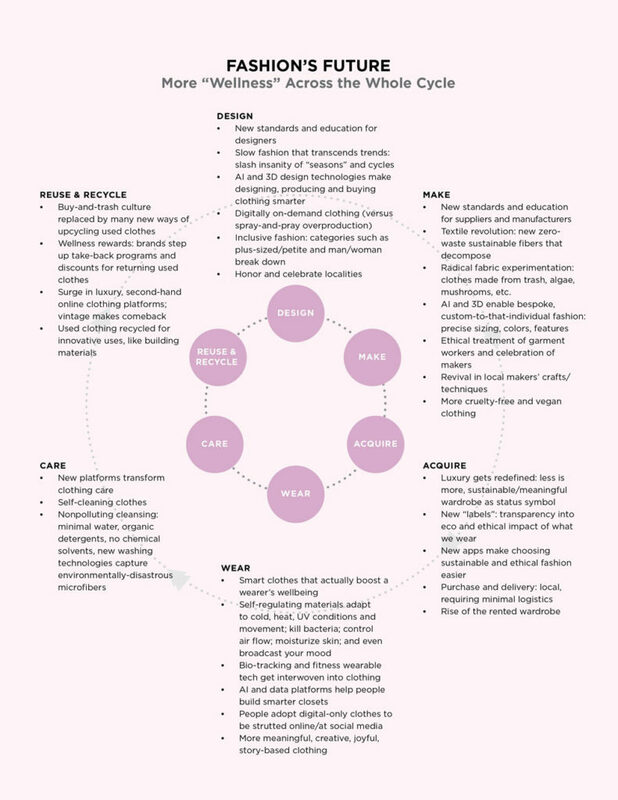 The future of fashion is re-thinking each touch-point in the cycle: from how brands design and make our clothes to how we buy, care for, experience and dispose of them. Every single point is broken, and the fashion industry is a massive force in destroying the planet and hurting people. As we’ve seen, there will be so many innovations that usher in a new age of sustainable, “clean” fashion—from a materials revolution crafting fabrics from plastic bottles and algae to the possibility of on-demand, bespoke clothes that fight overproduction to a surge in platforms that make recycling, reselling and renting our wardrobes a snap. And the new intersection between wellness and fashion will also mean clothing that can optimize our wellbeing—that regulates heat and airflow or helps us sleep or heal. There are many other things to discuss, such as fashion retailers bringing all kinds of wellness experiences into the store, whether it’s Eileen Fisher’s new Making Space test-store in Brooklyn that offers wellness education/experiences (such as Mindfulness-Based Stress Reduction) or big US shoe retailer DSW offering a “Sole Lounge” dedicated to foot wellness, including mani-pedis. A discussion is also needed around delivery getting radically more local (there’s a whole lot of shipping going on in the new online luxury resale and rent-your-wardrobe models). But the real future is about people getting real. It’s about each of us taking a very hard look at our fashion consumption behavior and some deeply honest stock of our emotional relationship to clothing. Because, while the appearance of so many amazing sustainable and ethical fashion brands is a wonderful thing, we will never be able to stop the nightmare environmental destruction caused by the fashion industry unless we stop buying so many new clothes, shoes and accessories. The most powerful solutions are low-tech. It means embracing that less is truly more, buying less new stuff, and keeping it longer. It means changing our attitude about pricing: We know that an $8 t-shirt can’t be sustainable or fair to workers. We need to recycle our clothes for reuse or resale. We need to buy more used or vintage or recycled clothing—it’s luxury for less. We need to proudly re-wear our clothes, a rising global movement being embraced by celebs, such as Cate Blanchett, Michelle Obama and Kate Middleton, with social media initiatives, such as it’s “chic to repeat” or #StyleRepeats. We need to wash/dry our clothes less and run cycles on cold. Of course, we will buy new clothes, but let’s proudly celebrate new “labels,” and brands that choose sustainability and treat workers and animals right. We think 2019 will be a watershed year where more people will trade in the addictive endorphins of manic fashion consumption for the serotonin (true peace and happiness) of buying slower and choosing clothes with values and meaning. It would be an investment in our mental wellness: Studies show people who focus on material possessions have more anxiety, depression, low self-esteem and intimacy problems. The overproduction and overconsumption of fashion, fueled by cheap global markets and materials, and which really kicked up in the 70s and went haywire in the 2000s, we think, is really just a blip in history. A more “well” fashion market and mindset is ahead. Council of Textile Recycling, 2018. Colleen Leahey McKeegan, “The 15 Coolest Tech Products Changing the Future,” Marie Claire, September 25, 2018, https://www.marieclaire.com/home/a23340334/next-big-thing-tech-products/. Divya Bala, “Well Healed: Can Clothing Cure?” Fashion: Inspiration (blog), Vogue Paris, November 21, 2018, https://en.vogue.fr/fashion/fashion-inspiration/story/victoria-beckham-fashion-as-wellness-ayurvedic/4109. Study in the International Journal of Fashion Design, Technology and Education, 2016. Copyright © 2018-2019 by Global Wellness Summit. 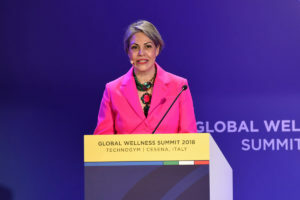 If you cite ideas and information in this report please credit “2019 Wellness Trends, from the Global Wellness Summit”.